Pineapple Guava is one of those plants you may have overlooked in the nurseries or the landscape through much of the season, but just look at them now! These tropical evergreens grow just fine here in south Texas with gorgeous flowers, edible fruit and gray green foliage year-round. Pineapple Guava make an excellent privacy screen, growing to about 12 or 15 feet without trimming. You can also keep them sheared back as a hedge or shape it into a topiary tree. Their thick gray green leaves give them a dense form. Grow them in well drained soil amended with some compost or soil conditioner. They'll thank ya. You can also grow these in large containers. While Pineapple Guava can be planted in full sun and is considered drought tolerant once established; it may still struggle a bit with our hot summer sun. If it starts to drop leaves, there's your warning that it's too dry. Regular watering though summer and providing some shade in the afternoon will help 'em out quite a bit. Now here's a bit of good news: these shrubs can tolerate winter temperatures down to 10º! Now let's get to the fun part. 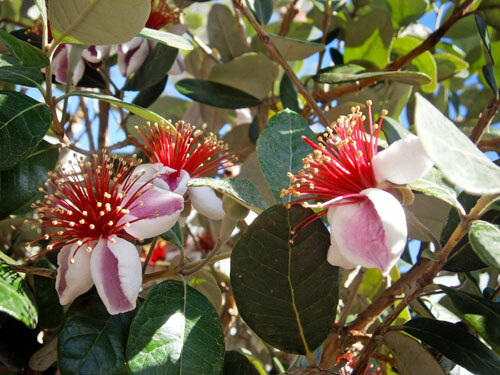 Fragrant Pineapple Guava blooms appear in early May with thick pink petals and red stamens. Hungry? Pick the petals for a sweet, crunchy snack. It will still set fruit if you're careful about plucking. The flowers can also be used as a nice edible garnish. Bees and butterflies love them too! The small green fruit will start to ripen in the fall. To get the best crop, fertilize and water regularly during the summer. They are reported to taste the best when you let them ripen until they fall off the plant. If you pick them early, put them on a sunny windowsill like a tomato to let them ripen. The fruits have a minty-pineapple flavor, but some people say strawberry! Cut them in half and scoop out the pulp with a spoon or quarter them and take a bite. Pineapple Guava fruits can be made into jelly, jam, used as pastry filling and more! One of the best things about this plant? It's virtually pest free! Even the deer aren't interested in this plant. Those thick leaves just aren't very appetizing to them. 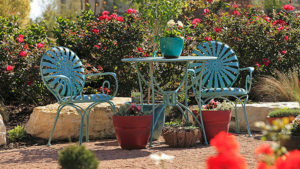 Ready to plant some of these in your landscape? Come on by The Garden Center, we have them in several sizes!